Plot: After an early success, writer Calvin Weir-Fields (Paul Dano) has been stuck with writer’s block for years and has found failure after failure in his relationships with women. Upon the advice of his therapist (Elliott Gould), he begins writing about a girl he sees in a dream. After a few dreams, the girl, Ruby (Zoe Kazan) appears in his home, miraculously brought to life. The two begin a romance that starts to crack when it becomes apparent that Ruby wants more of a life than the sequestered world Calvin has created for her, and in the end, Calvin finds himself in a struggle between love with the girl of his dream and trying to control that which he made. Thoughts: Every so often those Netflix recommendations get it right. I’d never heard of this film, but when I read the description I figured I’d give it a try. I had no idea just how deeply it would hit me. Admittedly, I may have a bit of an occupational bias when it comes to this movie. I may not be quite the success as a writer that Calvin Weir-Fields is (of course, as he reminds us during the film, he’s “no J.D. 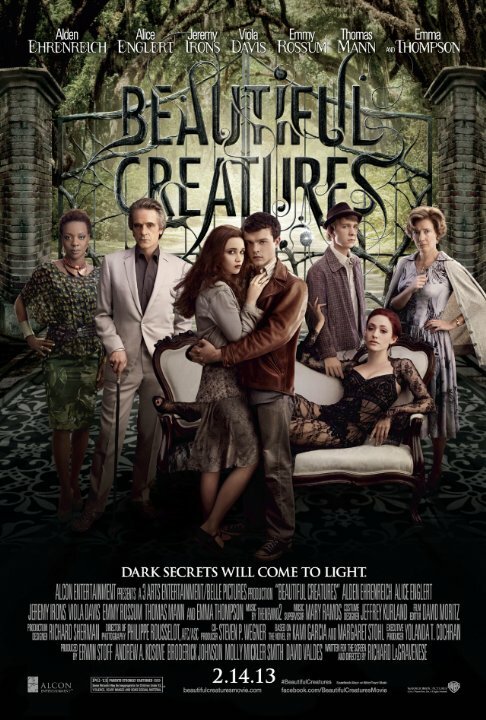 Salinger”), but I think any person who really pursues creative arts will be able to relate to this movie. The story hits upon a time in Calvin’s life when he’s struggling between crushing creative blockage and unbearable loneliness, something that’s all too real. And in fact, I can’t imagine there’s any writer out there who didn’t – at his weakest point – fantasize about doing exactly what he does in this movie. The idea of creating the perfect person, the perfect companion out of your imagination is tantalizing, powerful, and engaging. Of course, this is just a fantasy, and like most fantasies it doesn’t really maintain if you hold it up to the light of reality. We all may have imagined being able to create the perfect girl, but a little critical thinking will reveal a thousand reasons this would be a bad idea. Zoe Kazan (who both played Ruby and wrote the screenplay) takes this idea and dissects it beautifully. Early on Calvin’s brother Harry (Chris Messina) points out the difference between this perfect, idealized girl and the realities of a functional adult relationship. When Ruby turns out to be more real and less idealized than Calvin thought, he begins to use his writing to manipulate her, which again backfires. His first effort makes her frighteningly clingy and needy, the next turns her into a bounding child. Even attempting to erase his mistakes bounces back on him, as he instead leaves her an emotional wreck. The climax of the movie, I admit, is somewhat painful to watch. Frustrated and angry, Calvin reveals the truth of Ruby’s existence to her and “writes” her into performing a series of degrading, humiliating tasks (barking like a dog, for instance) to demonstrate his power over her. I cringed at each moment, watching him take someone he loved and turn her into a puppet. Each time he finished a sentence I found myself asking how he could do it, how he could possibly treat someone he loved in such a fashion, how anyone could be so frustrated that he’d do something that so utterly stains his own soul? Like the most painful things we see, though, it’s at its most horrible when we question what we would do in that same predicament. I don’t think I’d have it in me to do what Calvin does at the end, but it’s very easy to say that, knowing I’ll never have to face such a situation. In the heat of the moment, who can say what any of us are truly capable of? And if we ever did cross that line, would we ever be deserving of forgiveness, or capable of forgiving ourselves? 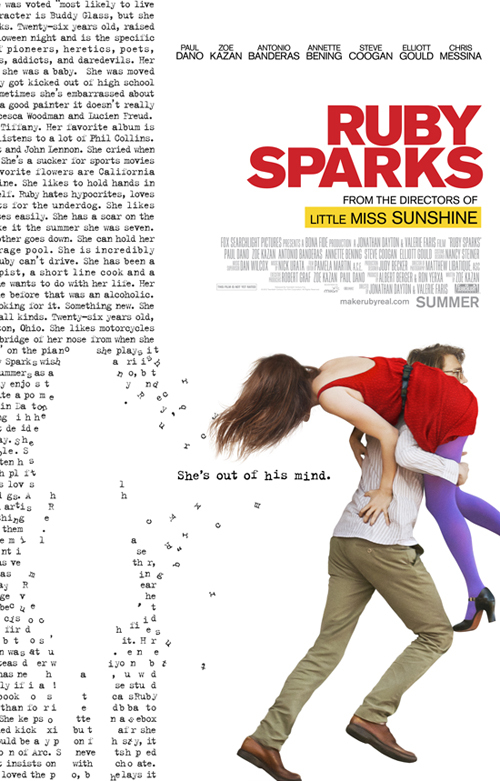 Although billed as a comedy, Ruby Sparks is definitely not cut from the standard romcom cloth that churns out so many practically identical movies a year. It’s not even the same as other “romantic dramadies.” For example, I recently watched Seeking a Friend For the End of the World, another romance from last year that treads the line between comedy and drama, including a dose of speculative fiction for the sake of the plot. In that one, Steve Carrell and Keira Knightley set out to find his lost high school sweetheart amidst the collapse of society that comes after final efforts to prevent an extinction-level asteroid from colliding with Earth fail. (Yes, this too is ostensibly a comedy.) While that movie wasn’t bad, in the end I found it sadly predictable. Ruby Sparks, on the other hand, isn’t predictable at all. Once Kazan deals with some of the more necessary tropes (showing how people react to this mysterious girl who’s appeared in Calvin’s life, a little interaction with his wacky family), the film is left in a sort of free roaming state where it could go absolutely anywhere. I never felt like I knew how the movie was going to end, which is probably the most exciting feeling I can imagine having during a movie. That open-endedness, that powerful, driving uncertainty finally brings us to an ending that’s ultimately sweet and hopeful, and a final line that couldn’t fit any better. Again, this is a movie that struck me on a very personal level, which makes it difficult to say if I would recommend it to just anybody – I can’t honestly tell you if you would have the same visceral reaction that I did. But I can tell you that it’s well-written, well-acted, very emotional, and different from all the other cookie cutter movie romances in ways that satisfied me greatly.